While all across the nation Canada is abound with natural beauty and wildlife, the rugged Pacific Rim is considered by many to be the ultimate destination. Every summer thousands of visitors from around the world flock to the west coast of Vancouver Island to experience untouched coastline, close encounters with wildlife and world class fishing, and while most make it as far as the coastal towns of Tofino and Ucluelet, some venture even further to more remote destinations like Barkley Sound. Home to Humpback and Gray whales, Orcas, bald eagles, black bears and coastal wolves just to name a few, Barkley Sound is one of the best places in Canada to witness wildlife in their natural element. It’s not uncommon to spot black bears scavenging along the shoreline at low tide, or have a Humpback whale surface alongside your boat while you’re out fishing – in fact for locals and summer residents it’s considered the norm. Barkley Sound is also where you’ll find the Broken Group Islands, a remote archipelago of islands that are world renowned for their kayaking and wildlife viewing opportunities. National Geographic has even listed kayaking in the Islands as one of their ‘Must Do Trips,’ calling the experience a “kayaker’s dream,” and one afternoon spent gliding through sheltered coves within an arm’s reach of colourful starfish, anemones and urchins is a clear indication of why. 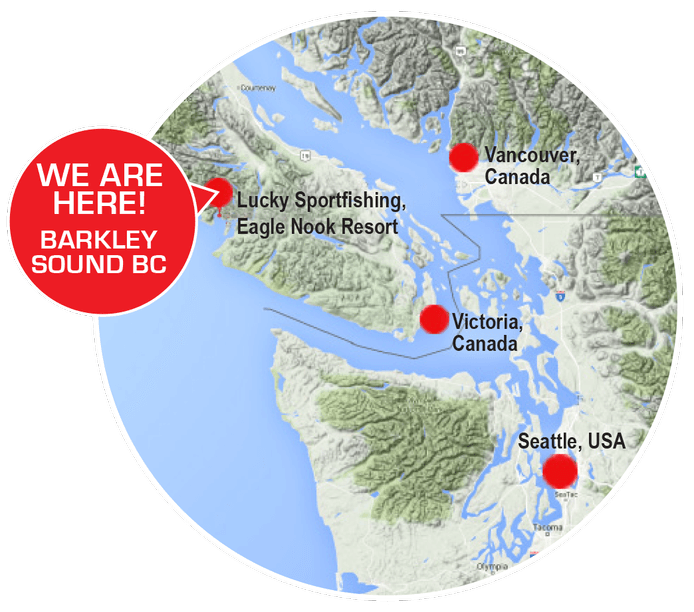 And all this is without mentioning the world class salmon and halibut fishing that brings fishermen (and women) from across Canada, the United States and Europe to Barkley Sound every summer. From May until mid September, alarm clocks up and down the west coast are set bright and early for 5:00am to be out on the water for the morning bite. The thrill of landing your first Chinook salmon is second to none, and it’s what brings so many people back to the Sound year after year. There’s no better way to experience the west coast of Vancouver Island than from the water, and there’s no better hosts to experience it with than Eagle Nook Resort. Nestled deep in Barkley Sound within the shelter of Vernon Bay, Eagle Nook is where wilderness meets luxury, and it’s the ultimate place to make your home base while you spend your days exploring the rugged BC coast. 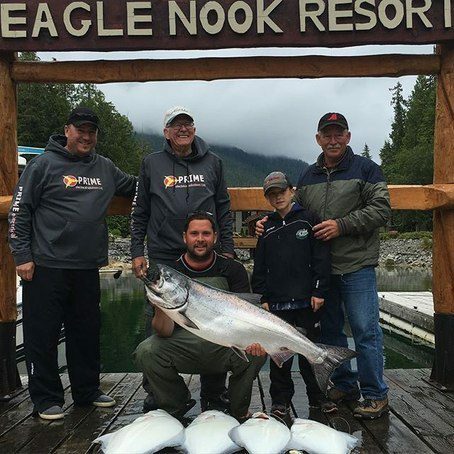 Offering fully customizable accommodation and activity packages, Eagle Nook has something for everyone, whether that be seeing wildlife up close and personal, experiencing the coast from the low profile of a kayak, landing a trophy salmon, or all three. With drive and fly in options available, it’s easier to get to than you’d think, and with all the comforts of home and more in one of the most remote and beautiful locales on the west coast, you’ll be glad you made the trip. Whether it’s an annual retreat or a once-in-a-lifetime adventure, it’s sure to be an unforgettable experience with Eagle Nook Resort in Barkley Sound. Eagle Nook Resort is one of few resorts on the west coast with an Artist-in-Residence, and probably the only one whose Artist specializes in fish rubbing, or Gyotaku as it’s traditionally called. Mya Deryan has spent her last four summers at Eagle Nook creating custom artwork for guests and staff alike. Her unique art form involves covering a fish in specialized black ink, and carefully placing a cloth or parchment over it to take a precise impression of her subject. The resulting impression is extremely detailed, showing every inch of the fish, down to the eyes, individual scales and even teeth. While some guests prefer to leave their rubbings in black and white, Mya can also bring pieces to life with colour and even create three dimensional reliefs of rubbings. Part of what makes fish rubbing souvenirs so popular among our guests is that the fish is still perfectly edible once the impression is done. Not only do you go home with a one-of-a-kind piece of art, but your fish can still be filleted, vacuum-packed and sent with you! Hiring for a resort that’s only open three months of the year is no easy task, so every year we start early, posting ads and recruiting people that we think will be the perfect fit for our unique lifestyle. 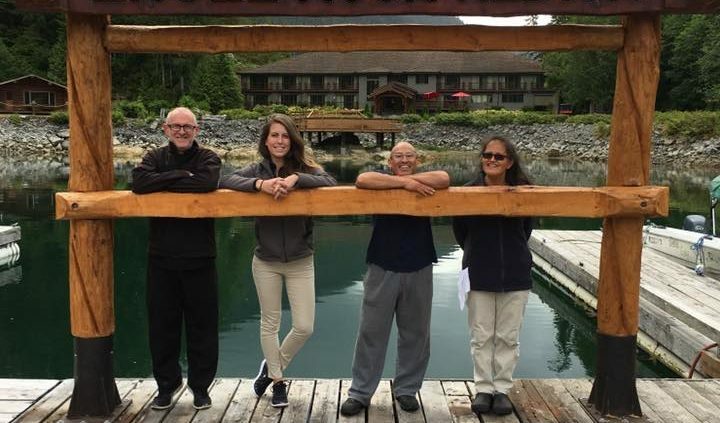 This season we’ll have a few returning faces, James and Ben, who whip up the gourmet meals that guests and staff get to enjoy everyday; Dennis, who keeps the resort up and running smoothly 24/7; Nadia, who goes back and forth from trip coordination, to dock handing, to guiding adventure tours, and of course our fearless leader Bossman Dan. At the end of last year we said goodbye to Martha, who was our amazing housekeeper and knower of all things. After 17 years with Eagle Nook Martha made the decision to start a new chapter and while we couldn’t be happier for her moving forward, we were definitely sad to see her go. She certainly left big shoes to fill but we’re confident the perfect person is out there! We’re also excited to be welcoming some new faces to the roster for 2017, Alli, who has a season in Bamfield under her belt and is looking forward to completing her business practicum with Eagle Nook, and Alyssa, who’s bringing her skills as bartender and server extraordinaire all the way from Edmonton. Alli, Alyssa, Nadia and two more yet-to-be-announced team members will round out our guest services team for 2017, and they can’t wait to get the season started. Let’s start with the answers to “What is a Tyee fish?” and “What is the meaning of Tyee? According to Wikipedia, it’s simply another of the many names for a Chinook salmon which include king salmon, spring salmon, Quinnat salmon in addition to Tyee salmon. But to west coast fishermen, it means a bit more than that. The name Tyee carries a certain reverence about it; even if you’re not entirely sure what it means, you know it’s something significant. The word actually comes from the language of the Nuu-chah-nulth people, the original human inhabitants of coastal Vancouver Island. It means king, chief or champion. Makes sense. When the term “Tyee” is applied to Chinook salmon then, it means a really big salmon. To fishermen on the west coast, Tyee refers to Chinook salmon weighing over 30 lbs. They’re considered a trophy fish and a pretty big deal to land. Tyee are definitely the king of salmon so it makes sense to want to keep some sort of souvenir of your catch. Luckily for guests at Eagle Nook Resort, instead of just taking a couple photos, our artist-in-residence, Mya Deryan, can create a life-sized rubbing of their fish and it can still be filleted and taken home for dinner. 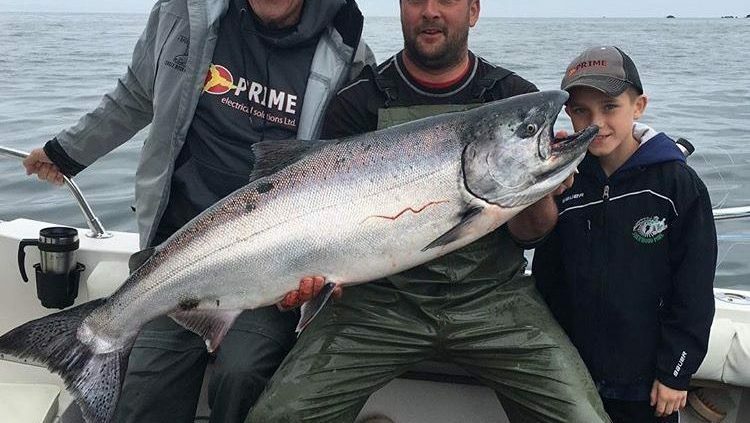 If you’ve fished on the West Coast of British Columbia chances are you’ve probably heard the term “Tyee” a couple of times, maybe you’ve even been lucky enough to catch one of these huge fish yourself. But really, it doesn’t matter what sized fish you catch, because time spent fishing is time spent well. At the beginning of each season before Eagle Nook is “officially” open you’ll find the Resort packed to the rafters with 45 fishermen eager to demonstrate their skills on the water and maybe go home with a little extra cash in their pockets. The annual Lucky Sportfishing Derby will be on its sixth year in 2017, and it gets bigger and better every year. Traditionally the Derby takes place the last weekend of May when Chinook salmon are starting to move down the coast and into Barkley Sound. In 2016 the winning salmon was 21.5 lbs, not bad for an early season fish! With cash prizes for the three biggest salmon and the biggest halibut, entries get snapped up quickly – so quickly that for the last two years we’ve added a second derby the following weekend. Guided boats and dock space for moorage are in high demand so let us know early if you’re interested in trying your hand at some friendly competition – your trip might even end up paying for itself! “Lodge life” is unlike any other lifestyle there is. One of the first questions guests ask when they hit the dock is “Wow! Do you guys actually live here?” We sure do. From the end of May until mid-September Eagle Nook Resort is our summer home, where we live, work and play on the West Coast. It’s pretty neat. Anyone who has visited Eagle Nook knows that our staff team is small. The person vacuum-packing your catch at the end of the day might also be your massage therapist. Or your server at dinner. Or all three. Having a small team means our days can be long, especially come July and August when the Resort is going full tilt, but we always find ways to have fun and take advantage of the amazing place we get to call home for the summer. Salmon and Halibut Fishing night bites are a definite staff favourite – two or three boats raft up in Vernon Bay, crank the tunes and watch the sun go down. The horseshoe pit was a popular spot last summer too; on any given night you’d find 5 or 6 Resort staff and fishing guides down there practicing their aim and making wagers on best-of-three tournaments. Inevitably, someone would miss their shot so badly the game would disintegrate into hysterical laughter and no one ever really knew who won. Living and working with the same small group of people all summer means we become something like a family, and one of the best parts of this is how it translates to our guests. We hear comments all the time about how great we work together and how much fun we genuinely seem to have while doing our jobs – the truth is, we love what we do and we love that we get to share Barkley Sound and Eagle Nook Resort with guests from all over the world. Like we said, it’s pretty neat. 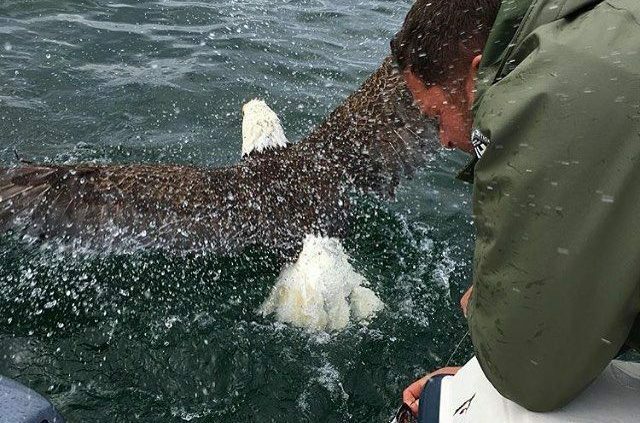 It’s not unusual for our guides to encounter various wildlife while out on the water, but this one was a little out of the ordinary – guide Jeff had a Bald Eagle try steal the fish off the end of his line and end up getting tangled! The Eagle was successfully released (not before soaking Jeff) and swam back to shore to dry off. https://eaglenook.com/wp-content/uploads/2016/10/eagle.jpg 640 640 eaglenook https://eaglenook.com/wp-content/uploads/2017/11/White-Shadow-2017-ENR-Logo-trans-e1512100309952-1030x405.png eaglenook2016-10-19 18:12:492018-04-12 09:46:19The Eagle has Landed! One of the biggest salmon that came back to the dock this summer was a 34.6lb Tyee, and came with a great story as well. Four generations of the Reid family joined us for a trip early in our season – father, son, grandfather and great grandfather. This monster of a salmon was reeled in by Charles Reid (second from the right), the great grandfather of the group, with his great grandson by his side. It was a moment the Reid family and Eagle Nook family will cherish forever. They had some great days on the water, and we hope to bring their good luck back to the resort sometime soon!